Hootendrammy! 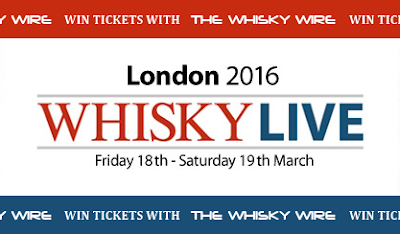 It’s very nearly that time of the year again, when Whisky Live rolls into London. After selling out in 2015, the world’s premier whisky tasting event returns to the stunning surroundings of the Honourable Artillery Company in the heart of the City on the 18th and 19th of March. In addition to the multitude of exhibiting whisky brands from all over the world, there will also be a whole host of other whisky based dramanagins including masterclasses, food pairings, live entertainment and exclusive private premium pours in the VIP lounge. If you’re just too eager to secure your tickets before they sell out, and why wouldn’t you, we’d like to offer all our readers a 10% ticket discount to this year’s event. Click Here to buy your tickets remembering to add discount code: WLL16TheWhiskyWire when checking out. We'll be there over the weekend, and it'd be great to share a dram or two on what promises to be a gargantuanly glorious weekend of whisky in London! Competition closes at 6pm GMT on Monday March 14th 2016. You have to be aged 18 years or over to enter. No cash alternative available. Competition winners will have to provide own transport/accommodation.